The question of whether to hire new talent most commonly comes up for IT teams who are skilled in older languages such as RPG. 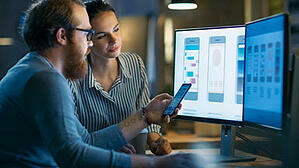 But here’s the good news: existing teams with knowledge of RPG can often create new mobile applications that work with existing IBM i systems. The IBM i platform has evolved to support web and mobile applications written in both new languages as well as RPG. Applications written in RPG do away with the traditional “green screens,” and can work with the reporting data to present it in more visually appealing formats. They can also deliver graphical reporting on different web and mobile interfaces. To accomplish these goals will definitely require a certain amount of upskilling for staff to become acquainted with the latest developments in RPG. However, this is usually not a daunting task for people who already have had years of experience in working with the language. Front End Skills: Creating the front end or the Graphical User Interface (GUI) for mobile applications is a critical part, as that’s mainly what drives usability. However, skilled front-end developers can be difficult to find, so be sure to have a good working knowledge of the capabilities you’re looking for before talking with third-party vendors. Flexible Toolsets: Most businesses will have some unique requirements when it comes to reporting data. So adopting third-party tools should be done carefully, with preference for ones that are menu-driven. It is also advisable to find out how much of these tools are proprietary, and which pieces can be scripted according to those unique requirements. Interoperability: Your application modernization strategy should always be interoperable, enabling your organization to be prepared to work with new systems or applications that you may build in the future. Therefore, it is important to choose a tool that is able to deliver applications that work even beyond the IBM i platform. These are just some of the important questions to consider for companies who are looking to “go mobile” with their enterprise architecture. Chances are, your existing team can be leveraged to develop the modern applications that your business needs; and should you decide to bring on board third-party vendors, just be sure to consider some of the factors outlined here. Also keep in mind, PSGi serves as a strategic partner to help your organization address its mobility goals while preserving your investment in both your IBM i infrastructure and your human resources.